Back in the days when comic books sold millions of copies a month, Dell Comics was at the top of the heap. Thanks to globally recognized and beloved properties like the Disney and Warner Bros. stable of characters (Mickey, Donald, Bugs, Daffy and the rest), the company was such a trusted brand that it didn’t even have to subject itself to the Comics Code Authority. Their motto was “Dell Comics are good comics”, and it was true. That is, unless you were talking monsters. In the early 1960s, perhaps in response to the monster movies of the 1930s and ’40s that were now staples of late-night TV syndication packages, Dell produced a series of “adaptations” of the classic Universal Monster movies, under the umbrella title of Movie Classics. Blessed with gorgeous painted covers, these monster comics promised any Monster Kid with a dime and two pennies in their pocket that they would be transported back to the blood-soaked, dark-shadowed world of the most famous monsters of all time. After all, Dell Comics are good comics! Unfortunately, it didn’t always quite work out that way. Over five weekends in October, Reel Retro Cinema is looking back at Dell’s attempts to bring big-time movie stars Frankenstein, Dracula, the Wolf Man, the Mummy, and the Creature to four-color life. Anyone with a heart condition must leave the room! For Frankenstein, click here — if you dare. For The Wolf Man, click here. 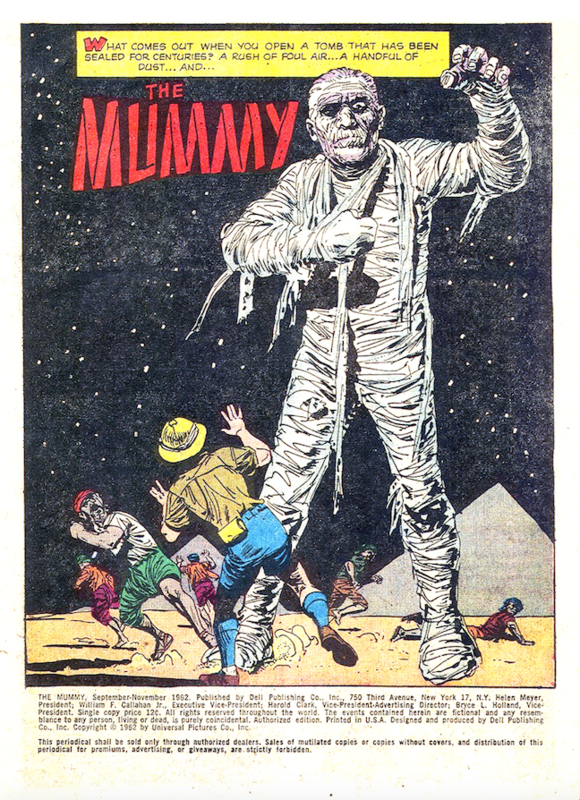 And now … The Mummy! Our main character pays this no heed either, and has the sarcophagus removed. As the diggers run off in terror, the Mummy arises, reducing the treasure hunter into a gibbering, terrified mess. The Mummy then walks off, to exact a plan of revenge that involves sending people a death scroll, which leads to the Mummy hypnotizing them into killing themselves. After a couple of deaths, we meet a beautiful woman named Kipa, who receives the grim totem. A pipe-smoking archeologist named Bart tells her the story of the scroll, and we flash back to ancient Egypt, to a young man named Ahmed who practices black magic. Ahmed approaches the Pharoah with his magic, but the Pharoah’s advisers tell him to reject Ahmed and his dark arts. After some examples that the magic is real, the Pharoah has Ahmed buried alive, in mummy wrappings, to ensure his evil soul never escapes his tomb. Bart has figured out that the Mummy found a few days ago is Ahmed, and sets up a trap using Kipa as the bait. The Mummy sneaks into Kipa’s house and tries to hypnotize her, but is then tackled by Bart and some police. Kipa was given contact lenses to prevent the Mummy’s stare from controlling her, but the same can’t be said for the driver of the car the Mummy is carted off in! The Mummy has the driver crash the car, and escapes. He climbs atop a pyramid, but trips when the stone crumbles beneath his feet. The Mummy falls, presumably to his death, but when Bart checks the body, he finds only the empty wrappings. The…End? Like Dell’s adaptations of Frankenstein, Dracula and The Wolf Man, this story bares no resemblance to the film on which it is supposedly based. 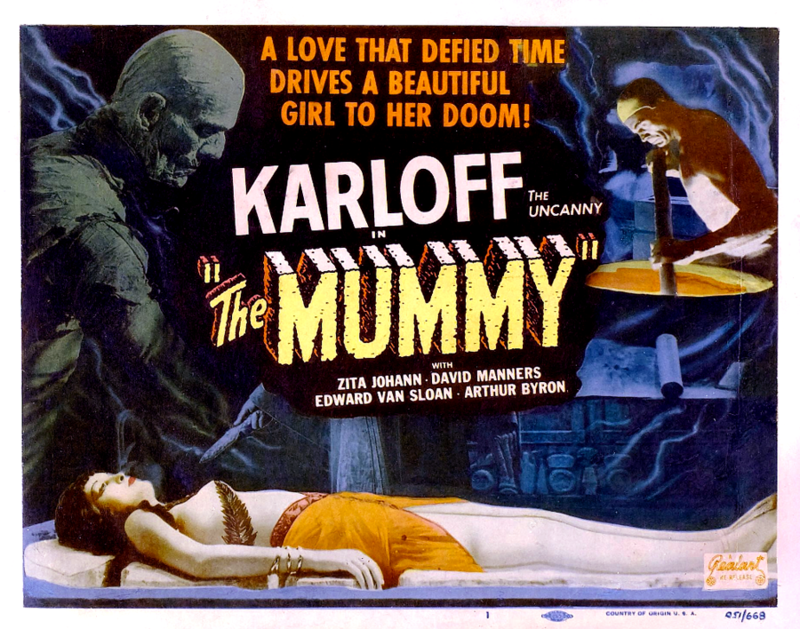 The original Universal Mummy produced in 1932 featured the legendary Boris Karloff as Imhotep, who returns to life obsessed with reuniting with his love from another time, now taken form as a modern woman named Helen (the exotic Zita Johann). 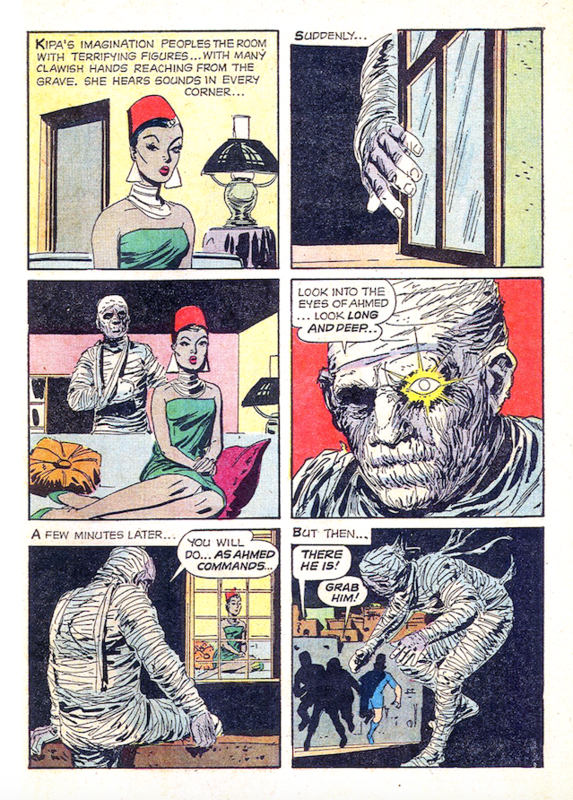 Restrained in its scares even by 1930s standards, the only real “shock” moment of the film, replicated in this comic, is when the Mummy awakes and terrifies the archeologist. That’s not really meant as a criticism, because overall I liked Dell’s The Mummy. Jack Sparling’s artwork is a heck of a lot more stylish and exciting than Bob Jenney’s, and the scenes with the Mummy actually pack a bit of a punch (the one exception is when the Mummy is seen in the police car, which looks, unfortunately for the Mummy’s dignity, comical). I was never quite certain how the whole “death scroll in the mail” bit worked, exactly (maybe it’s like the video tape in The Ring?) but it didn’t really matter. The scene where Kipa is used as bait is effective, and I liked the Mummy’s various super powers (he melts some handcuffs using a kind of heat vision thing). It also has a more classic ending, with the Mummy potentially still out there, and ready to cause more mayhem. As always, though, the best thing about the comic is the cover. I couldn’t find any official credit, but I think it’s safe to say it’s the work of Vic Prezio, who handled the covers for Frankenstein, Dracula and The Wolf Man. 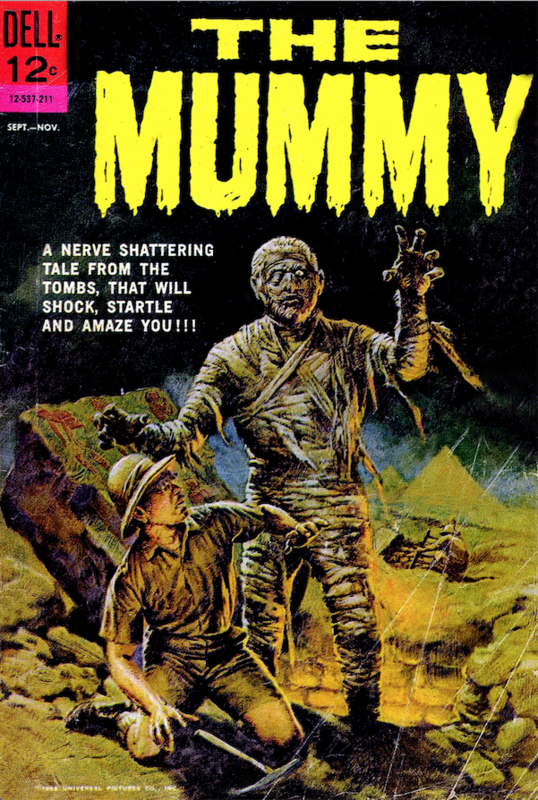 Wonderfully evocative and dripping with mood, it would have made a great movie poster for any of the half-dozen Mummy sequels Universal cranked out in the mid-1940s. Of the four Movie Classics we’ve looked at so far in this series, I’d say The Mummy is at the top of this particular pyramid. NEXT: The Creature! Click here. Rob Kelly is a writer/artist/comics and film historian. He is the co-host of The Fire and Water Podcast (and the host of its sister show, The Film and Water Podcast), the co-creator and writer of the award-winning webcomic Ace Kilroy, and the creator of the book Hey Kids, Comics! : True-Life Tales From the Spinner Rack. He has never been to Egypt, but his Dad visited the pyramids once and said they were pretty cool. 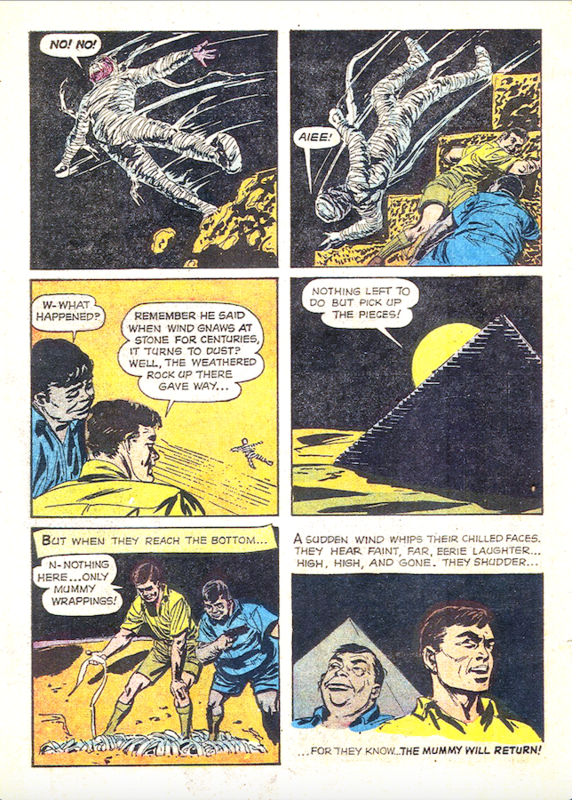 The Mummy here in many of the panels reminds me of Lon Chaney Jr.’s Kharis, with his one good eye in his arm in a sling. The art is a huge improvement over The Wolf Man comic. Oddly enough, I picked up a modern Classics Illustrated Robin Hood comic this weekend, drawn by Jack Sparling with a cover by Vic Prezio!